David and Lucile Packard Foundation. Courtesy New Buildings Institute and Jeremy Bitterman. No matter how you approach it, design is all about trade-offs. And when designing a net-zero building—one that produces as much renewable energy onsite as it consumes from the grid in a calendar year—finding the sweet spot among trade-offs like cost, comfort, and performance isn’t easy for most people. But think of it this way: In one hour, the earth receives more energy from the sun than we use all year. And as renewable energy technologies advance and designers become savvier with new approaches to integrated design, net-zero energy initiatives are starting to move from the fringe to the fore. Even leading companies like PNC Bank and Walgreens are getting in on the action. Successful net-zero energy building design requires creativity, innovation, and a new mindset for teamwork. Architects, engineers, and builders have to pool their talents and expertise in ways that lead to solutions that might not be obvious following a more linear or siloed approach to make a building. 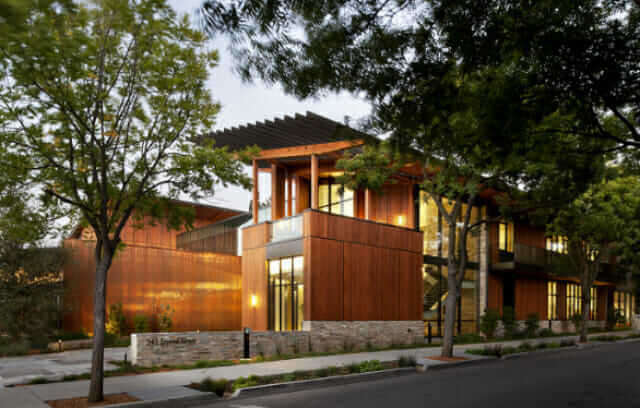 Take for example the newly constructed David and Lucile Packard Foundation headquarters, a net-zero building with a cooling tower that provides water to a 50,000-gallon water storage tank. Evening air passively cools the water so that during the day it can be circulated to chilled beams that displace warm air in the building. It’s not exactly a traditional HVAC system for the U.S., but along with other creative design strategies, it helped the Packard HQ boast impressive energy-reduction outcomes. Achieving net-zero energy might seem impossible to many designers at first glance, but there are some trends and distinct, practical points that can help make it easier. 1. Complete an Energy Budget at the Start. It’s critical to start with your end goal in mind. Before embarking on any aspect of the design, make sure to set an energy-performance target. It should be included in all design documentation and communicated clearly down to subcontractors. Everyone needs to be on board. An integrated design approach is crucial for setting a realistic energy budget, and early design charrettes are a good place to start. Achieving a successful net-zero energy outcome relies on every single party being on board and in line with the goal early on, along with a strong advocate to lead the project. Otherwise, it probably won’t work. Example of energy use savings with a solar budget. Courtesy New Buildings Institute. 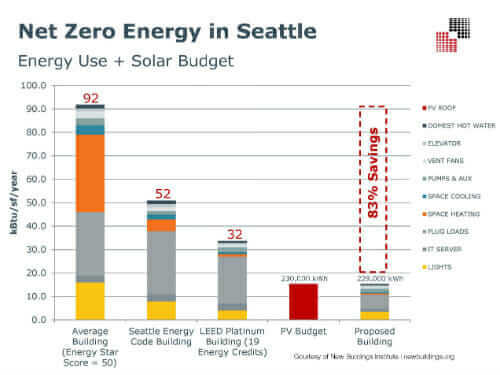 A recent New Buildings Institute report found that successful net-zero project teams set a “solar budget” that quantifies the solar-energy potential available at the site. This guideline helps set energy targets and drives decision making throughout the project-delivery process. It’s critical to understand with a high degree of precision how energy will be used in the building, especially by occupants and their plugged-in devices, which is difficult to predict in most cases. 2. Use High-Performance Strategies—and Find a Good Interior Designer. When it comes down to the actual design, most successful net-zero projects get there using tried-and-true energy-saving practices. Old favorites such as careful orientation for optimal solar access, thoughtful daylighting strategies, and a highly insulated building envelope are usually a place to start. Of course, intensive site research must be done in order to optimize both the location and the building configuration for the best access to daylight. A narrower footprint may be a good call in order to capture more daylight and lighten the interior electrical load. A building’s interior-design strategy can play a big role in achieving net-zero energy. Yes, light paint colors and fabrics are still an important component. But some trends require careful coordination between architects and interior designers sooner in the process, such as open work spaces, low partitions to increase natural ventilation, and light shelves. 3. Pay Attention to Technology. When you look at the pack of proven and aspiring net-zero buildings, there are some interesting technology trends to notice. Since lighting and HVAC loads end up accounting for the majority of energy consumption in commercial buildings, it’s not surprising there are some non-traditional approaches all designers should have in their green-design arsenal. HVAC systems in net-zero buildings are usually far from traditional. Standard rooftop package units and variable air volume (VAV) systems usually take a backseat to more efficient systems that decouple ventilation from space conditioning. Radiant heating, ground source heat pumps, chilled beams, and natural ventilation appear frequently in net-zero success stories. And once low-energy HVAC and lighting systems are part of the design, making sure they’re working as intended is essential. Monitoring and automation systems help ensure a building is on track by diagnosing problems and providing dashboards for occupants and facility managers. 4. It’s Alive: Now Keep Tweaking Things. Unlike other design projects, the measure of success is not after the last brick is laid. It’s when a building is fully operational, meeting its energy budget, and making an ongoing impact. Fine-tuning is always required, which means a net-zero building is never truly “finished.” Just like life, net zero is a journey, not a destination. So getting occupants on board isn’t an option, it’s essential. Once a team has taken steps to make the building’s envelope and systems as efficient as possible, it’s key to understand and track what kinds of things the building users are plugging into the walls. From refrigerators to space heaters, cell phones to computer monitors, plug-load energy reductions should be the final focus before sizing a solar-panel system to generate clean energy onsite. Getting to Zero. Net-zero energy building is becoming more mainstream. No longer on the fringe, the process, best practices, and strategies are creeping into the collective consciousness of the design community. While there’s no one-size-fits-all approach to succeed, tapping into these trends is a good starting point for getting there.